At SHIKHAZURI, we take packaging seriously. Very seriously! When we received a flattering testimonial from a customer who described her recent purchase as packaged to perfection, we felt inspired to share our delightful process with you. Your exquisite jewellery is carefully wrapped in delicate sheets of handmade paper, then gently inserted into a silky organza pouch. Once the ink dries, these are inserted into an envelope with a jewellery care card which let’s you know how to look after your newly acquired treasure. The envelope and jewellery pouch are ceremoniously laid into an enchanting box made from banana leaf fibre, lined with vibrant Kenyan kikoi cloth on the inside and vivid Maasai shuka fabric on the outside. It’s the perfect combination to keep your jewellery protected and makes a beautiful keepsake for years to come! 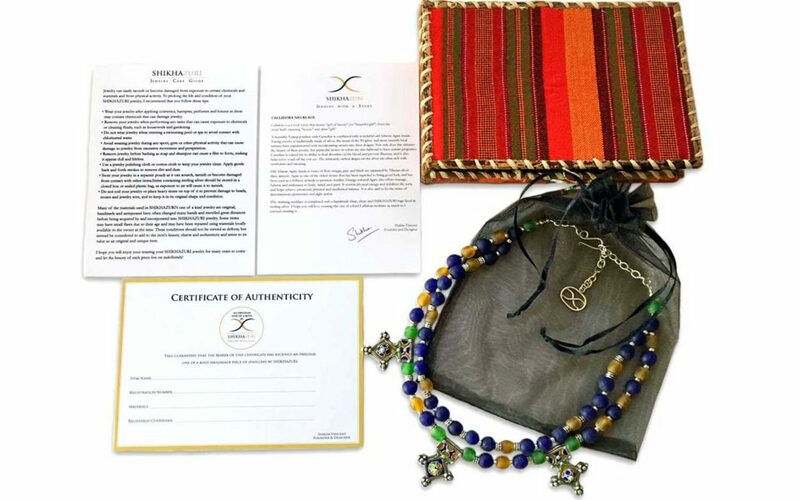 * If you’re buying SHIKHAZURI jewellery as a gift, we can insert the recipient’s name on the Certificate of Authenticity to indicate that they are the custodian of the piece, or it can be left blank – just drop us a note when purchasing to let us know so that we can get it packaged to perfection for you too!